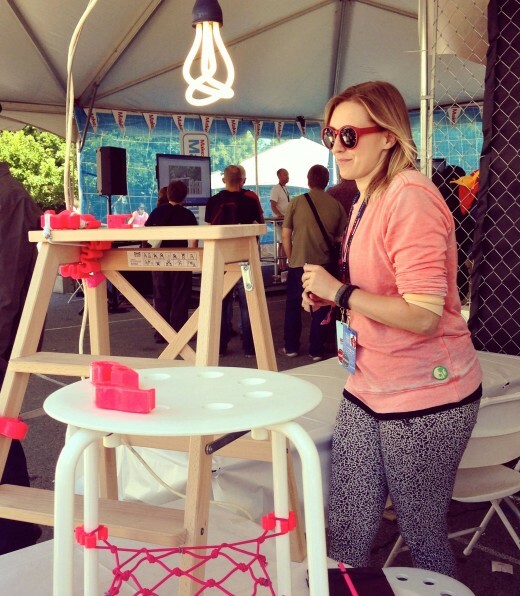 MFA DT wins an "Editor's Choice" ribbon at Maker Faire! 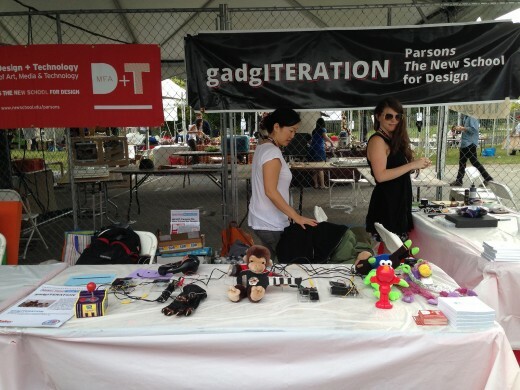 The MFA DT booth at this year’s Maker Faire was awarded an “Editor’s Choice” ribbon! 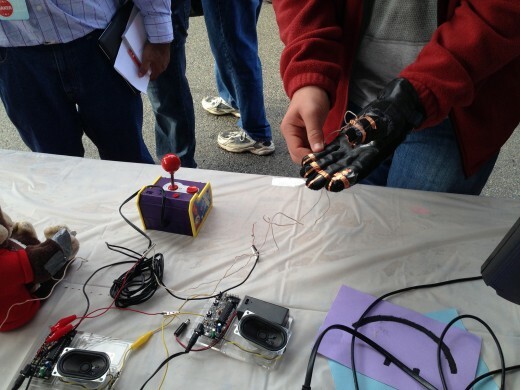 Congrats to all those involved who were able to share their fun, innovative projects! 3D printed modifications for furniture. Katherine Moriwaki (Faculty and MFA DT Director), Louisa Campbell (Faculty), Jonah Brucker-Cohen (Faculty), Joe Saavedra (Alumnus and Faculty) and Liza Stark (Alumnus and Faculty) presented the ever-wonderful “GadgITERATION.” More info can be found here. Katherine and Liza on the scene! Kyle Li (Alumnus and Faculty) presented Portalcade. PORTALCADE is super cute too! 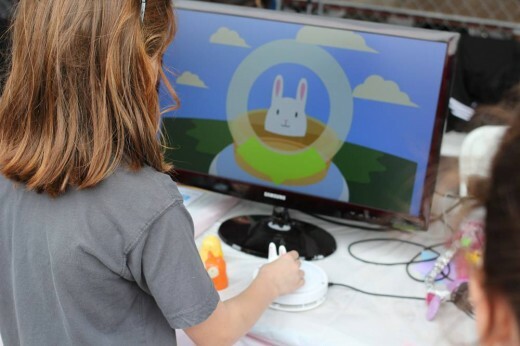 PORTALCADE is great for kids! Liza Stark (Alumnus and Faculty) presented “Computation Craft”. Computational Craft explores how traditional crafting techniques can be interwoven with new materials and technologies to generate new behaviors and interactions. Studetn Fei Lui presents Browsercize! AMT Admin getting a workout with Browsercise! Aisen Caro Chacin (Alumna and Faculty: post-graduate fellow) presented “Scent Rhythm”. 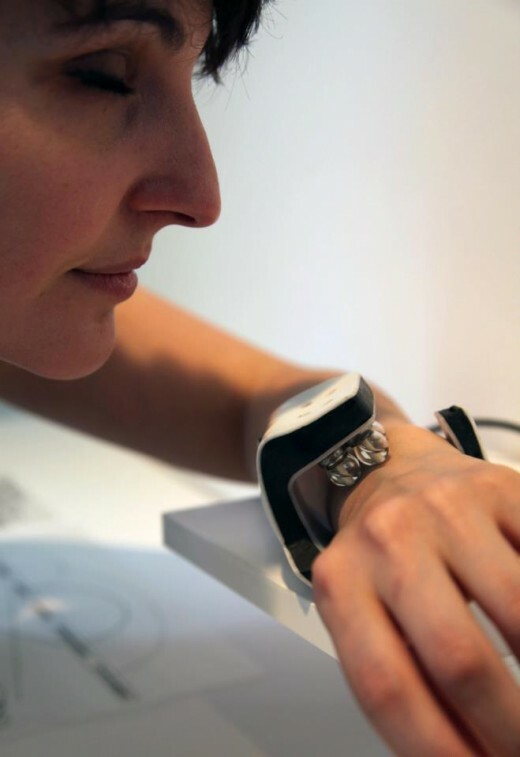 Scent Rhythm is timekeeping device that maps relational olfactory sequences to the body’s circadian cycle. The sense of smell is a chemoreceptor, which means that these sensors can detect chemicals. The sense of time, chronoception, is not based on the function of a specific organ, but rather the result of the interaction of the cerebral cortex, cerebellum and basal ganglia. This device attempts to keep a chemical watch on the circadian rhythm, by administering fragrance+supplement concoctions associated with the daily activity of the moment to promote the production of certain neurotransmitters, such as chamomile+melatonin during sleeping hours, and espresso+caffeine to get you through the morning! Find out more here! “Blockuits is a working prototype of large, foam building blocks, some with a variety of electronic outputs and some that are purely analog. Modular and sustainable, this toy is also multi-sensory, with components such as music, multi-colored and multi-shaped blocks, colored LEDs, various textures and vibration motors. A few of the blocks are embedded with a 9-volt battery, providing power to the blocks that contain electronic components. When children place an electronic component block on top or below the power block, the circuit is completed, and children will be able to see, hear or feel the result of their action. All blocks also use magnets, further supporting the system structure, and strengthening the circuit. Children are able to build, improve, manipulate their space, and play within the structures they create while learning the concept of cause and effect. 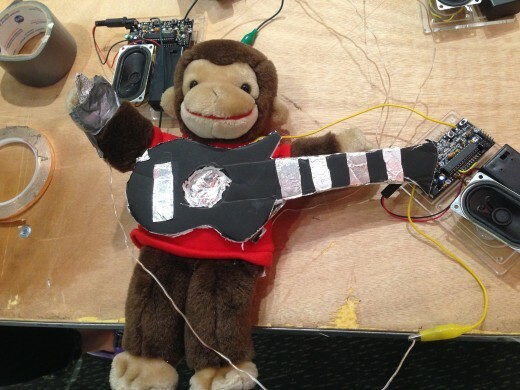 This prototype develops both the left and right sides of the brain, both logical and creative. 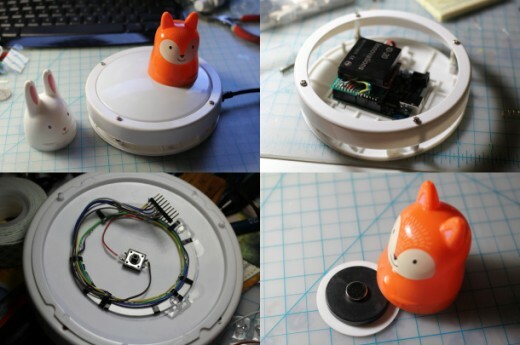 Instead of being 100% screen based, this toy is a tactile, three-dimensional experience, as well as an electronic one.” More info can be found here. 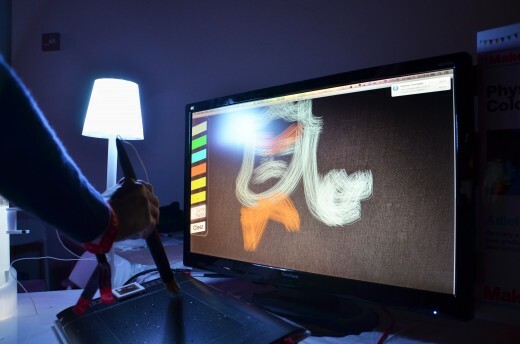 “The Physical to Digital Color Mixer is an experiment in tangibility. Mixing color in the real world is a fun, tactile-rich experience. Mixing color digitally by changing RGB values, while efficient, lacks any of the tactile feedback of its real world analog. The Color Mixer is an attempt to blend the tactile feedback of mixing paint with the versatility of mixing digital color. 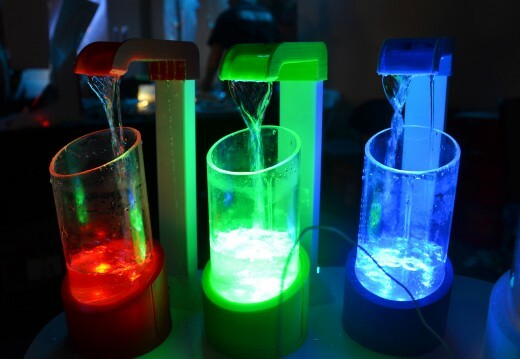 A user begins by selecting a cup of water illuminated with red, green or blue light. The color can then be poured into a central mixing tube where a sensor will detect how much of the selected color has been poured in. The light shone into the mixing tube then changes in real time as the user pours, allowing any color to be created on demand. Unconscious Play is about Chance Composition. This method of making sound art was proposed by John Cage since 1950s. Introducing chance into art making has a number of important consequences: it diminishes the control over the artistic product, and it mirrors the randomness of everyday life.